At least several people have died after a huge fire raged through the night at Grenfell Tower in west London, a fire chief says. 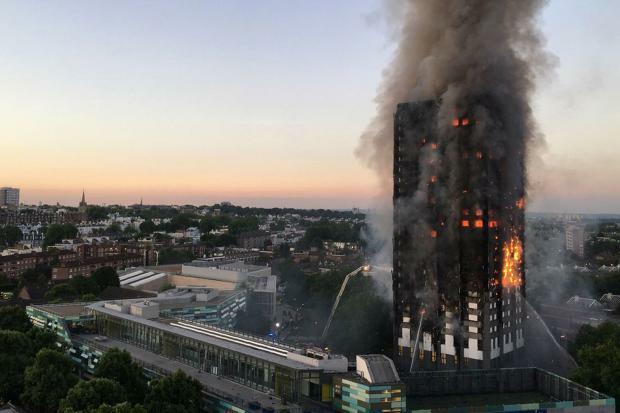 Eyewitnesses said they saw people trapped inside the burning 27-storey block, in north Kensington, screaming for help, and shouting for their children to be saved. According to London Ambulance, more than 50 people are being treated in hospital. The whole tower had been alight and there were fears the building might collapse. Eyewitnesses said they saw lights – thought to be mobile phones or torches – flashing at the top of the block of flats, and trapped residents coming to their windows – some holding children. London Fire Commissioner Dany Cotton said there had been “a number of fatalities” but she could not say how many because of the “size and complexity” of the building. “This is an unprecedented incident,” Dany Cotton told reporters. Dany Cotton said the cause was not yet known. Matt Wrack, of the Fire Brigades Union said something had clearly gone badly wrong with fire prevention procedures at the building. Firefighters would normally fight a fire in a tower block from the inside, going up the fire escape, and fighting using the internal dry-rising mains, he said, but that’s not been possible in this case. “Several hundred” people would have been in the block when the fire broke out, leader of Kensington and Chelsea Borough Nick Paget-Brown said. There are also local collections under way for spare clothes, toys and toiletries for those now homeless. The first reports of fire in the Grenfell Tower, in Latimer Road, on the Lancaster West Estate, came in at 00:54 BST. Three hours later, people were still being evacuated from the tower, the police said. Grenfell Tower was built in 1974 by Kensington and Chelsea Borough Council. It is part of the Lancaster West Estate, a sprawling inner-city social housing complex of nearly 1,000 homes. Grenfell Tower underwent a two-year £10 million refurbishment as part of a wider transformation of the estate that was completed in 2016. Work included new exterior cladding and a communal heating system. Grenfell Tower, containing 120 flats, is managed by the Kensington and Chelsea Tenant Management Organization (KCTMO) on behalf of the council. The local Grenfell Action Group had claimed, before and during the refurbishment, the block constituted a fire risk and residents had warned that access to the site for emergency vehicles was “severely restricted”.